I had the good luck of watching Udaan with the BF yesterday. The family was out for a dinner party. They had taken SS with them. So that left me with only RS to worry about. The BF had brought a DVD of Udaan (which he said he’d heard a lot about) and we got down to watch it. After being abandoned for eight straight years in boarding school, Rohan returns to the small industrial town of Jamshedpur and finds himself closeted with an authoritarian father and a younger half-brother who he didn’t even know existed. Forced to work in his father’s steel factory and study engineering against his wishes, he strives to forge his own life out of his given circumstances and pursue his dream of being a writer. The movie started off well enough, with the regular antics of teenage boys in a hostel. The friendships(which lay the foundation for an important role in the decision made by the lead towards the end) are not forced and come off naturally. The interactions between the boys are depicted in such a casual manner, it does not seem as though they are acting or reciting memorized lines. It all comes off naturally and beautifully. 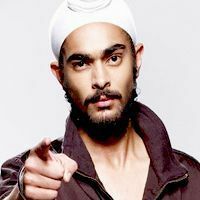 A word for the young actor Manjot Singh, who plays Muninder. This young lad was engaging enough in “Oye Lucky Lucky Oye” and even here too, he does justice to his few minutes of screen space. Even when he’s not present on the screen (like the time Rohan calls him) you can feel his presence. This is one young man to look out for!! Once Rohan comes back home, the movie takes a more sombre turn. Rohan now has to acknowledge the presence of a 6-year-old half-brother. He doesn’t remember much of his own mother, having lost her early in life. And it seems like a wicked twist of fate that even the young half-brother Arjun (played adorably by Aayan Boradia. See him in the video below. I couldn’t find a snap of his on the net 😦 ) loses his mother early and has to live with the awfully authoritarian father (played by a goose-bumpingly evil Ronit Roy). The way the brothers bond, or more importantly, how Rohan comes to accept and love the little boy are depicted so beautifully, one is left with a tiny little lump in the throat throughout!! Ronit plays the authoritarian father Bhairav with such fierce intensity, it is difficult to differentiate between the actor and the character!! I always considered him as the typical soap-opera-ish actor . But in this movie, he redeems himself. Once or twice, we are given glimpses of why exactly he is the way he is. A couple of references to his father and the way he was brought up was enough of an indication. But then, the same fate was borne by his brother, the much more cheerful Jimmy (played with wonderful constraint by Ram Kapoor) and one can surmise that Bhairav did not take kindly to the treatment meted out to him by his father. Maybe thats why, inspite of spawning two children, he prefers they call him ‘Sir’ rather than ‘Papa’ or ‘Dad’. This way, he can distance himself emotionally from his children. Though he claims to fulfill the material needs of his kids, the one thing he can’t give them is his love and acceptance. He takes Rohan on a run every morning, just to prove that he is physically superior in every way and intimidate the teenager.Little Arjun, meanwhile, is in silent awe (fear?) of his father. When Bhairav asks for his son’s forgiveness one night, one hopes for happier times ahead for the family, but then the next few scenes easily squash that hope. It might appear a little depressing to a viewer to find the boys being continuously at the receiving end of their father’s ire. But that is exactly what leads Rohan to make his final decision. Maybe his being a poet stops him from taking a more drastic action early on. Even when he is egged on by his new-found friends (a very likeable Anand Tiwari) , he doesn’t do anything rash. He is controlled and patient. And when the time is right, he makes his move. And we are all with him. That last letter speaks out his frustration, but not in such terms. Though it contains angst and regret, it also speaks of hope, of love, of family. And for those lines alone, it is worth watching the movie. The last scene, of Rohan and Arjun walking hand-in-hand is enough to make you reach for the tissue box. Why are such movies not spoken about often? ? It was one of the best movie’s I’ve seen in recent times (maybe, TZP). The pace of the movie was initially slow, but then later on I realized that the pace was necessary . To make us absorb what was happening on the screen. To take in the expressions on the face of the protagonists, to read their eyes and the subtle body-language, which spoke volumes. Throughout the movie, me and the BF could not help but rue that there can actually be such parents in this world. But then, we hear of much worse in the real world. This movie was reasonably milder in its treatment of the father-son relationships!! But what a narration!! And what performances!! It’s rare to see a film where each and every character puts in his best. A special mention must be made for Rajat Barmecha who plays Rohan. This young boy with the puppy-dog eyes was the right choice to play Rohan. He displayed amazing sensitivity in his scenes with his brother and a deep vulnerability in the scenes with his father! The mother in me just wanted to envelop him in a hug and soothe his worries away!! And ohh…for some reason, I kept thinking that little Aayan looks a lot like my SS. In fact, I felt that SS would grow up to look a lot like Aayan. Which is a good thing, because, Aayan is just so adorable 🙂 !! Fundoo movie indeed. I heard it’s the true story of director Anurag Kashyap of Dev D fame. Its rare to see 6-year old kids behaving as 6-year olds in Hindi movies. Either they are super brilliant or super bratty (the kid from Bhoothnath) or super annoying (The kid Farhan in Fanaa!! ). Oh it’s an amazing amazing movie. Ronit is mindblowing in the movie.. I could not believe that it was the same Ronit Roy! Hi Sukhada, thanks for dropping by. Hv heard a lot abt the movie too. Must watch it sometime soon.